Actor Suriya on Settai Sets! 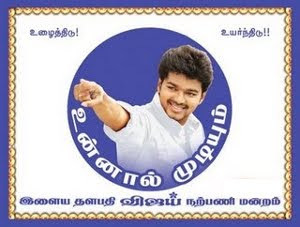 Director Selva denied reports on his efforts to remake Rajini - Kamal's classic Ninaithale Inikkum with Ajith - Vijay. Ileana's manager is reportedly in talks with Vijaya Productions to have her onboard the film that will have Ajith in the lead role. The actress is keen to pair up with Ajith because she feels that Ajith and Vijay are the two icons of Tamil cinema. Since she has paired up with the Ilayathalapathy in Nanban, Ileana is looking forward to an opportunity to share the screen space with Ajith. Will things work out for this pretty lady? Let's wait and watch! Priyamani has dismissed reports that her mother visits Mumbai often to hunt Bollywood projects for her. "We will never go behind offers. And there is no necessity for us to do that," says the National Award winning actress. "My relatives reside in Mumbai. So my mother goes there to visit them. Other than this, there is no professional reason attached to her frequent trips to Mumbai," the 'Paruthi Veeran' girl says further. She adds, "I am at present busy with two Kannada films, two Malayalam movies and one Telugu project. Even two Hindi offers came my way. Official announcements will be made very soon by the people concerned." Priyamani's first film in Hindi is 'Raavan' directed by Mani Ratnam. "Working with Mani Ratnam is a dream come true for any actor or actress in these parts. I am happy that I got one. It was a great experience." The Settai team had an unexpected visitor on the sets yesterday. The shooting of this film is fast progressing and out of the blue dropped in Suriya, who was shooting for the KV Anand directed Matraan at the sets erected nearby. 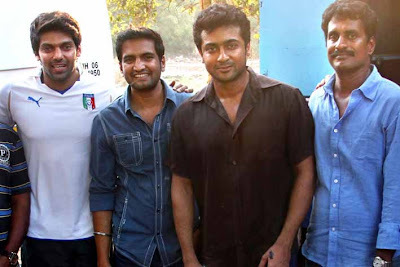 The entire Settai team including Arya, director Kannan, and PG Muthiah were happy to meet Suriya who spent some time talking to the cast and crew of Settai. The Settai team then visited the Matraan sets and were awed by the huge set built there for the shooting. UTV's Dhananjayan said that the Settai team was happy with the interaction with Suriya and loved every minute of it.